Just outside of the city of San Francisco, Alcatraz Island sat in the middle of the bay, and served as a federal prison for 29 years. It was considered nearly impossible to escape, and it housed some of the world’s most notorious criminals, like Al Capone. For many, the idea of ending up on this island was a nightmare, and the prison is supposedly haunted by the souls of the people who were trapped behind bars. However, few people have heard the story about the children who grew up on the island and called Alcatraz “home”. Alcatraz had as many as 300 convicts living in the prison at any given time. Supplies were delivered periodically to the island to help support the lives of the convicts and the employees living there. It was possible for employees to leave by boat, but it was mostly a self-sustained place. Many prison employees volunteered to live on the island full-time in exchange for discounted rent of just $18 a month. Even with modern inflation, that is like $200 per month for multi-million dollar views of the San Francisco Bay. It was a far shorter commute as well, and young families could save their money for the future once they moved. 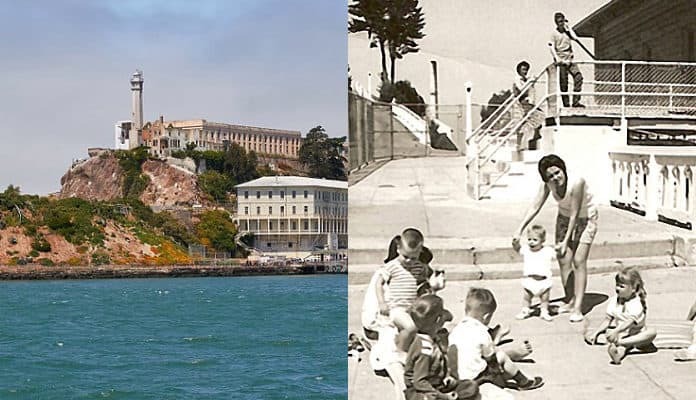 This was shortly after The Great Depression, so for many families, the opportunity to live on Alcatraz was a dream come true. Even back then, the cost of rent in San Francisco was normally very expensive. Over 100 children were living on the island, and many of them grew up together from the time they were infants. There were even babies born there, with their birth certificate saying “Alcatraz Island” as their place of birth. Everyone knew each other’s names, and the kids had tight-knit group of friends that felt more like family. All of the children had to take a boat on and off the island in order to attend school in the city of San Francisco, so the groups of kids going to class back and forth probably felt more like cousins or siblings than neighbors as they went on their trips back home. The island had three-story apartment buildings, duplexes, and even private cottages. Even though they were not far from hundreds of convicted felons, the residents still never locked their doors. After all, prison guards and police officers were all over the place, and the bad guys were behind bars. In a way, it was almost safer to raise a kid on this island than it would be in the outside world. There were not big lawns of grass on the island, so kids spent most of their time roller skating down the roads that only had the occasional vehicle driving on it. They played baseball, flew kites, and raced bicycles. Some of the kids even raced one another in a soap box derby, and they took the competition very seriously. There were also big game rooms with pool tables and a jukebox where some of the older kids would hang out. There was a strict rule that the kids were not allowed to play with toy guns or play games like “cops and robbers” (for obvious reasons) but parent managed to sneak them in, anyway, and they would play in the privacy of their own homes. As the years went on, some of the officers bought color TV’s, and kids were glued to screens to see their favorite Saturday morning cartoons. Two-thirds of the island were restricted, meaning that the civilians were not allowed to enter the areas where the prisoners lived. While civilian adults feared going there and mostly, kept their distance, the kids saw it as a challenge. They would climb the rocks to try to see if they could sneak a peek inside of the fences. There were guards who could see them, of course, and would let it slide, so long as the kids weren’t actually getting into any trouble. One former resident named Bob Orr grew up there from 1941 to 1956. He would encourage his friends to sneak out to camp on the beach. This was strictly against the rules, of course, but the kids managed to do it anyway. To them, it was like a summer camp that lasted forever, and they made a huge group of lifelong friends.